The stellar artisanship and dedication of the members of the Barbados Defence Force were recognized at the official ceremony for the Geriatric Services National Appeal Day, on the grounds of St. Michael District Hospital, under the theme: Caring For Those Who Cared For Us: Returning the Favour. In his featured remarks, Lieutenant Colonel The Honourable Jeffrey Bostic, MVO, BA, Minister of Health and Wellness applauded the work of the BDF personnel and thanked Colonel Glyne Grannum, the Chief of Staff, for his prompt response to the call to assist. Under the direction and supervision of Building Rehabilitation Projects Manager, Major Lubin Maxwell, the team successfully executed the renovation of the Hospital. This involved repairs to the roofing structure, ceiling replacement, refurbishment of the bathrooms, electrical upgrades, and window installation and correction. 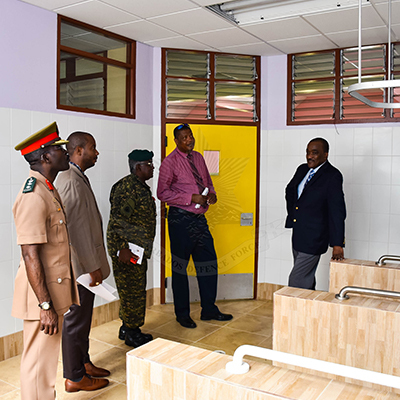 Maj Lubin Maxwell explaining the bathroom facilities renovations to Minister of Health and Wellness The Hon Jeffrey Bostic.